I'M FREE!!! I wrote my last final (okay it was a take home final) and finalized my 2 essays today. HELLOOO WINTER BREAK!! "So where are you going for break Selina?" "...nowhere. When you have a mortgage to pay..."
Yep. That's reality for ya. I'm probably not going to go anywhere until the summer of 2017...because I'm planning on taking summer school again this year *cries* But hey, at least I'll get to graduate sooner, right? Well, on the bright side, at least I have an entire month to sleep until 10 am...YIPEE! I love December, it's my birthday month and Christmas!! But then again people tend to give you one present and say "Here's a combined present!" December baby problems. So keeping with the budget sushi theme, I went to Sushi California the other day with my mom for our sushi fix! I actually had a pretty horrific experience at their West Broadway location last year ~ thankfully this visit was leagues better!! The food was actually pretty awesome this time! I wasn't expecting this to be that good but I was pleasantly surprised! Now I know why they have this listed as one of their most popular items! This was basically stir fried kimchi pork, topped with tempura bits in a stone bowl!! Sounds simple but the ingredients worked beautifully together! 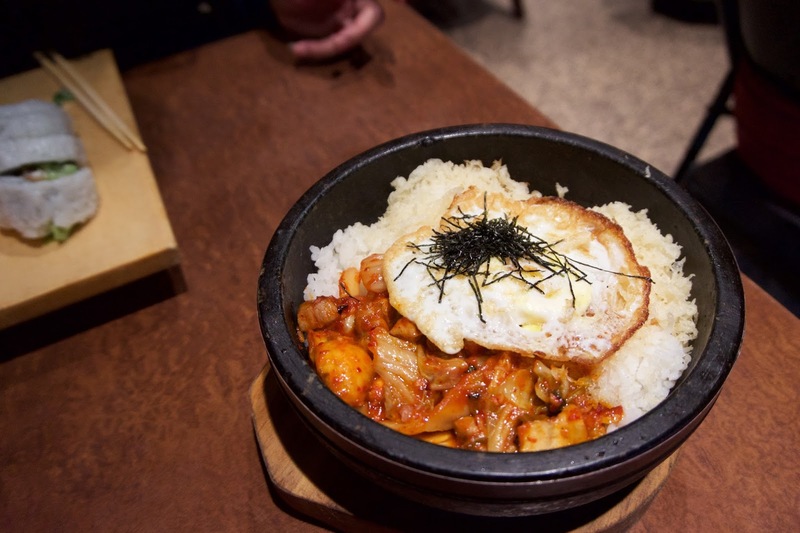 The kimchi pork was really flavourful and it tasted like gochujang - sweet, spicy, and tangy! The tempura bits added a lot of texture and made the entire bowl really fragrant! The rice gets all crispy which is my favourite part! I was a bit sick that day, so for the sake of my health I asked them to omit the teriyaki sauce (to lower my sodium intake.) They happily obliged but the salmon still turned out to be really yummy! The serving size was huge!! 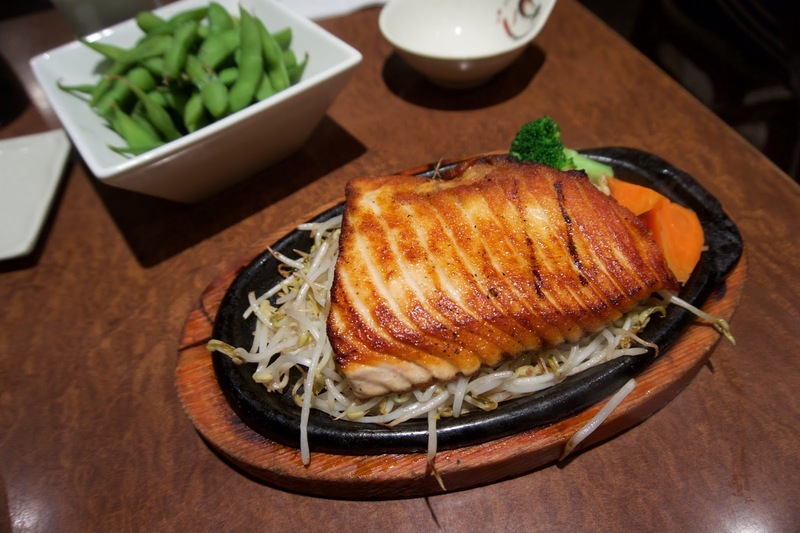 The salmon was properly cooked, but it could've been more flaky. There was also a generous portion of bean sprouts on the bottom, which I really appreciated! I also ordered a side of rice because this was a la carte! My mom really wanted sushi, so she asked me to pick out some big rolls (ie. 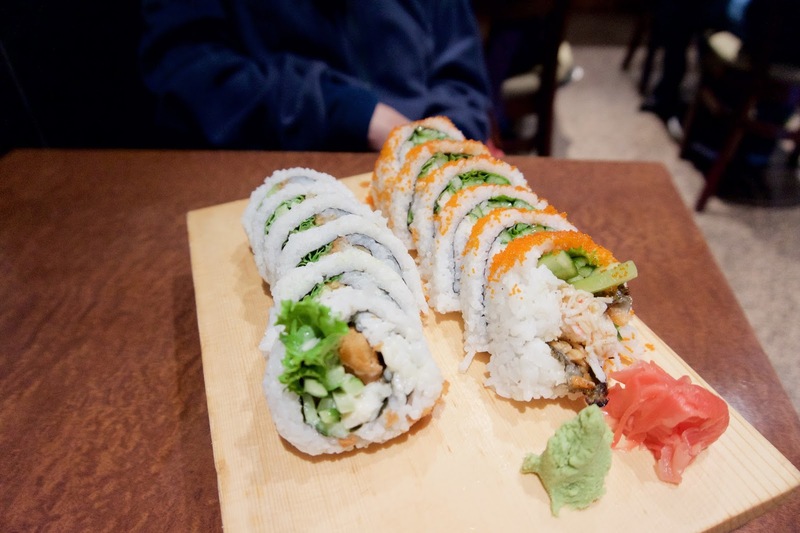 nothing maki sized!) My mom doesn't eat raw fish so the Filet o Fish and BC roll seemed perfect for her! The rolls were loaded with veggies, with minimal rice on the ouside. The rice was pretty much a fail though. The rice was actually wet, and really soggy. The filling was decently yummy though, the filet o fish came with breaded fried cod and the BC roll had fish skin/imitation crab in it! This was a very generous serving of edamame, so I was really pleased! The portion size was a lot larger than the edamame served at other places! 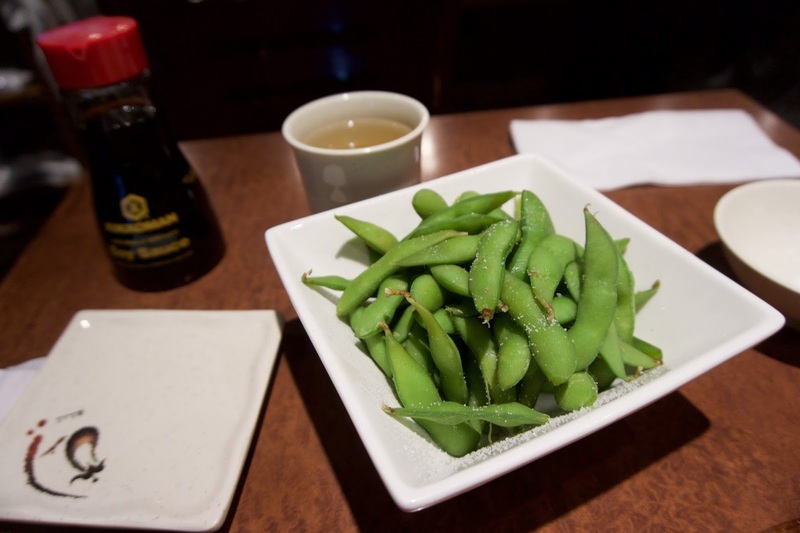 The soybeans were bright and crunchy, and the exterior was seasoned with some salt. This is the same rice they use for their sushi, and it definitely works better in a bowl. It's really sticky and doesn't really work well in rolls. But as filler, it did it's job! LOL Selina! I spend big bucks on nigiri sushi so I can try out the sushi chef's skills and sometimes their creativity. And unfortunately, the most expensive ones are usually the ones that look the most appetizing to me. I mean, how can I resist that $3 piece of delicious, melty toro? 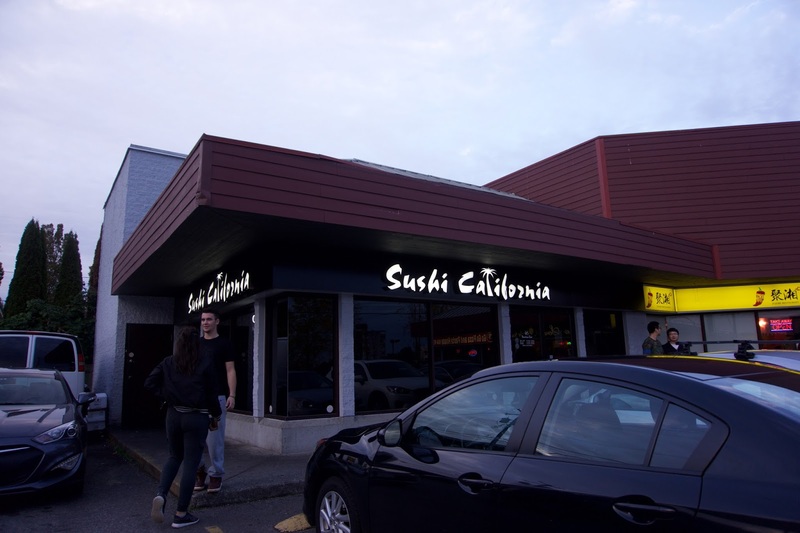 I like how you managed to avoid most of Sushi California's flops. 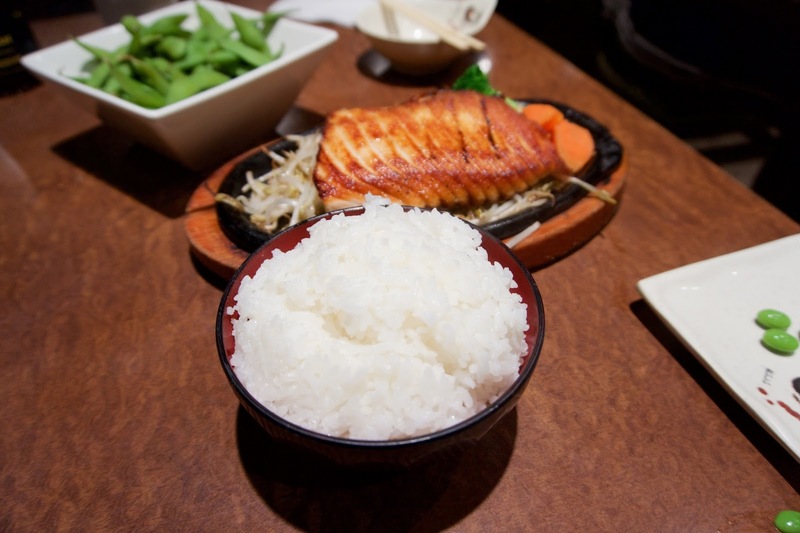 The sushi rice is indeed problematic and I often find myself preferring their cooked food. Unfortunately, that doesn't go well for a sushi-based food blogger lol. I love your comic, Kim! That's why when I visit small towns, I'd rather visit McDonald's or Subway than dine at Diarrhea Dragon! LOL indeed!! Nigiri is definitely the best indicator of a sushi chef's skills! But I'm no sushi connoisseur, so I guess I'll just stick to sushi that's easier on my wallet heheh. @Selina Haha I think I've had about 20 different kinds of nigiri from Sushi California - sometimes they get it right, sometimes they don't. The unagi was actually good as they torched it right on the spot. Don't worry, I've experienced many horribly executed rolls before starting my blog. It's something I would've done anyways, blog or no blog. That's how much I love my special rolls LOL. @LotusRapper That tamago looks divine - I hope I can afford it some day! I heard that a quick 20-minute lunch at Jiro's restaurant costs well over $300! This place used to be pretty good until they started using a sushi rolling machine. lols.